I selected this book for two reasons. 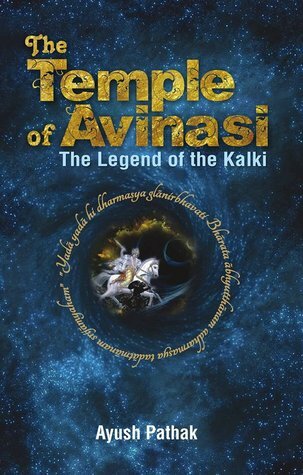 First was because its story sounded interesting, and I am intrigued by the legend of Kalki. For those who don’t know, Kalki is supposed to be the final incarnation of Lord Vishnu. Secondly, this books completes the mythology part of my Once Upon a Time challenge. The world faces oblivion as the four thousand year old Epic Wars threatens it with a renewed assault. This time, the Dark Seekers, alien invaders who were once prevented access through the great shield which protected the Earth, have returned. The Light Seekers and the mortals must do all they can to fight them back once again like they did in ages past. However, with a Dark Lord at their Helm, the Dark Seekers are nearly undefeatable now. Nearly, for in the devastation that they leave, they also raise the cries of the people for the saviour they have long awaited. The prophecized tenth Avatar of Vishnu, a juggernaut myths and legends named Kalki. And in this fray, two fourteen year old boys innocently oblivious to the machinations of a secret cult dedicated to finding Kalki, try to spend their childhood as boys do. But the fate of the world depends on them and the hour demands the final avatar of the Protector of the Universe. Like all the mythological stories, this is a story about fight between good and bad. More than that, it is the story about identifying the balance of good and bad in one’s own self. Although the summary sounds too difficult, the book isn’t. The book explores the world of Light Seekers(or Devs) and Dark Seekers, and tries to give a scientific twist to the mythology by calling them as an alien. And then a teenager gets the taste of the power of being Kalki, that savior. Scientific Twist to the mythology: The book approaches many of the aspects of Vedas in a scientific manner. I never thought of Sudarshan as a double edged sword. Neither I thought about the planets having a protective shield(like ozone) which makes them appear barren to the people from other planets. I could feel the wheels of my engineer minds turning. Story treatment: I enjoyed the subtler aspect of the story, like the ego of the Devs, mixing of Ramayana and Mahabharata, and the flying horse. The names of the characters: This is my problem with many Indian books. The names like Mr. Betterclouds, Angel, Ana confuses me. Why not have proper Indian names if the characters are going to stay and behave as Indians?! Underutilized plot-lines: Many plot lines are left unexplored, like the enmity between Shree and Indra, budding romance between Ana and Angel, potential of Alisha and Sam. Since the book is going to have sequel(s), I’m sure they will be explored later, but for now, they are left hanging in between. An interesting book which deserves reading. I’ll probably buy the sequel too to know what happens next. Maybe there will be some more interesting concepts.